This month we would like to share with our readers a touching moment in our company's history. A key member of our team, Dr. Diana Branzea, has decided to move on to pastures new and departed the company at the end of March. We wanted to offer our colleague and friend an unforgettable farewell party to thank her for all her hard work whilst she was part of the team. To do so, the team visited the Escape Rooms Cardiff to take on Oculus, a thrilling murder-themed experience in the heart of the city. We are pleased to say the team made it out alive, with 4 minutes to spare on the clock! We hope Diana enjoyed her day as much as we did and even though she is no longer part of the team, she will always remain a beloved friend and we wish her all the best with her future endeavours. Housing in the UK is among the least energy efficient in Western Europe. Although houses in England are recommended to be at least 18˚C at all times, many households do not meet this standard, leaving the inhabitants at risk of ill health. To overcome this issue, on April 1st 2019, Innovate UK launched a Small Business Research Initiative (SBRI) competition in which all UK based businesses can compete for up to £1.25m to develop non-intrusive ways to monitor a household’s environmental condition. Successful projects will work with Leeds City Council and the City of York Council, so it critical that applicants take into consideration the different types of homes in Leeds and York, including high rise tower blocks which include a variety of tenants. Around 5 research and development contracts are expected to be awarded, with projects lasting up to 3 months. A total of £250,000 including VAT has been allocated to this phase. Amongst the successful applicants from phase 1, two will be awarded R&D contracts of up to £500,000 including VAT, to develop a prototype and begin field testing that can last up to 12 months. March 1st 2019 will represent a memorable date in our BreathSpec project timeline, as the project was invited at the Breathomiocs2019 event, that took place at the Pendulum Hotel in Manchester. The event, organised by the Breathomics research Group of the University of Manchester and the Royal Society of Chemistry (RSC) Analytical Division, gathered interdisciplinary and transnational engineers, chemists and physics from as far as Canada, to present and discuss over novel methodologies in the analysis of chemical compounds from exhaled breath as a rapid and non-invasive technique towards disease detection and pollutant monitoring. During the one-day event, important sampling, analytical, and data processing strategies to enhance the capability of breath analysis in the clinical and commercial environments have been showcased. Among these, our BreathSpec project received a lot of attention, as many approached our booth to ask more information about the functionalities of the device and the role of the European funding within the project. The BreathSpec Booth at the Breathomics2019. The response was enthusiastic and many were surprised by the efforts the project is making in completing the clinical study, which is currently undergoing. As the project coordinator, Dr. Emma Brodrick (Imspex Diagnostics) stated, "It is unbelievable how much attention the project got during the event! 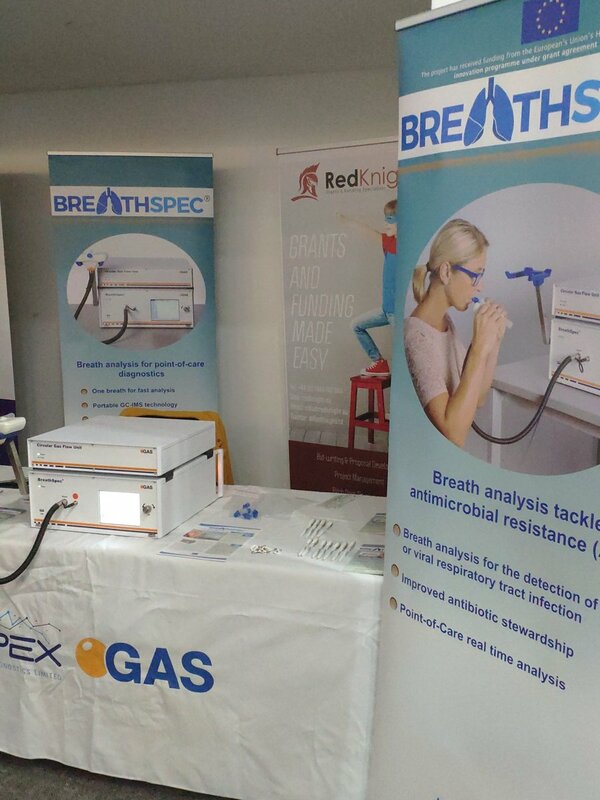 Of course, we [the BreathSpec Consortium] decided to attend the Breathomics expecting some interest in what we are doing across the UK, but the interest around the results of the patient recruitment and the specificity of the machine was beyond any expectation!". Another month, another successful Masterclass delivered by our team of experts! 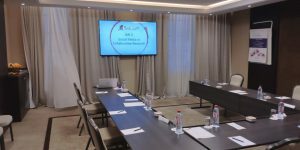 This time, RedKnight went right into the heart of Europe to deliver a 2-day session in Brussels on the important of Impact in EC Funded Research & Innovation projects. The course, which took place between 18th and 19th February 2019, was a new seminar organised by our trusted associates at the European Academy, with the aim of teaching the importance of Communication Dissemination and Exploitation activities within European funded projects. For this occasion, we sent our Project Manager, Matteo Radice, who was thrilled to share his experience - gathered managing the BreathSpec project - with the attendees. Upon his return to RedKnight HQ, Matteo said, "It was an amazing experience and I really enjoyed it. The class was very receptive and engaging and there were some very interesting discussions going on throughout both days. Also, having a representative from the European Commission provided incredible added value. I believe Communication and Dissemination activities deserve much more recognition amongst all research and innovation projects, as they are of utmost importance in letting European taxpayers know how the EC is investing in innovative ideas for the future." Talking more in depth about the course, Matteo went on saying, "The course is designed to give participants a thorough overview of what the EC is expecting from project participants and how to best deliver it; from the legal boundaries, to the most effective storytelling techniques and how to better engage with social media. It's packed of information and the participants loved it!" For any news about this course and all the other RedKnight masterclasses, visit our website www.redknightconsultancy.co.uk. 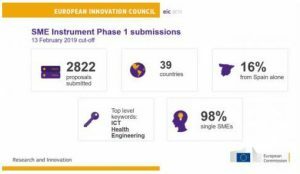 According to the latest report from the European Commission, 2822 proposals for the SME Instrument Phase 1 have been submitted before the latest cut-off date on 13 February 2019, to compete for a chance to win a lump sum funding of €50,000 to carry out a concept and feasibility study. Overall, SMEs from 39 countries submitted proposals, with Spanish applicants sitting at the top of the charts with the biggest number of proposals for this batch (428), followed closely by Italian (384) and Swedish applicants (160). The most popular areas of activity for applicants were ICT, health and engineering. Since 2018, the SME Instrument is part of the European Innovation Council (EIC) pilot. A novelty under the EIC pilot is that applications are fully bottom-up. Therefore as there are no longer set topics, proposals are classified according to keywords introduced by applicants. The top keywords introduced were, ICT, health and engineering and technology. Stay tuned – results will come out in late March 2019. We at RedKnight wish to thank all the participants who entrusted us with their proposals and we wish all our clients the best of luck!! The next round of calls for this competitions will start from 7 May 2019. If you are interested in competing for the SME Instrument (Phase 1 or Phase 2), but you are not sure where to begin, contact RedKnight for a free consultancy. According to the European Commission research chief Jean-Eric Paquet, Horizon Europe will offer more "flexibility" to foreign countries that wish to join the new EU’s biggest ever R&D programme, which will run for seven years from 2021. The idea, said Jan -Eric Paquet, is to offer association membership that would allow former Third countries to participate in EU research under the same conditions as member states. This is indeed a proposal that already has stirred some interest from important partners (such as Canada) and it is expected to induce more foreign partners - at least between 20/30 - to seek association. However, although this is looks like a very promising development to the "open door" policy issued by the European Commission, internal disagreement and, a legal framework that still makes any EU programme too bureaucracy-intensive and, therefore, less appealing to major countries such as the US. On top of that, the most ambitious R&D programme ever, might risk losing two of the most influential countries. As a matter of fact, Horizon Europe includes in its preliminary legal text a category of countries that may be barred from programmes designed to encourage innovation. The proposal still needs to be approved by member states yet, if the text is not amended, the whole programme is indeed destined to kick-off in 2021 amid serious uncertainties around the status both the UK and Switzerland will hold in the programme. With regards to the Alpine country, Swiss researchers have already experienced the effect of an exclusion from EU R&D funding when, in 2014, Switzerland was temporary relegated to third country status, with no access at all to important opportunities, such as the SME Instrument. The decision, due to an issue of migration quotas, caused the country to fall rapidly from a 3.9% to just 0.3% of all project coordination between 2014 -2016. When it comes to the new programme, instead, Switzerland has been classified in category 4 of non-EU states. Strictly speaking, this new classification should not affect funding of Swiss research projects however, the heads of Switzerland’s two Federal Institutes of Technology, the Swiss Federal Institute of Technology in Zurich (ETHZ) and and the Swiss Federal Institute of Technology in Lausanne (EPFL) have recently voiced their concerns that funding restrictions could apply anyway, unless a political settlement between Swiss and EU politicians is reached. UK Research between a "no deal" and pledges to "fully associate"
If talks between Swiss and the EU politicians have been going on since 2014 to reach a political agreement that might safeguard the “cake-and-eat-it” model granted to Switzerland, Britain’s research institutions have been trying to fill the recently increased political gap by engaging in alliances and agreements with other European counterparts. the idea behind this diplomatic effort is that “If the UK is left out of any part of Horizon Europe, it makes the programme less appealing [and] it lowers the level of competition, and probably lowers the value of the grant.” (Jessica Cole, head of policy at the Russell Group). For as bold as this statement can appear, it cannot be denied that in the much feared event of a no-deal Brexit, the new Horizon Europe will lose a net contributor that currently weights for the 14.3% of the total funding awarded by H2020 to date (€5.1bn) and counts the highest number of successful projects. These are all things that are very well taken into consideration in Europe as well and, although “A lot of people are thinking that ERC grants would become easier to win without the involvement of Cambridge and Oxford, [...] we need to defend the continent against the big money being spent on research in the US, Japan and China. We need our strongest team, so we should find a way to keep UK in the game.” (Olivier Küttel, EPFL head of European public affairs). Berlin hosted the first leg of a whole new season of training which we forecast being even more successful than the last one! On 28th and 29th January 2019, RedKnight Director Dayne Hodgson travelled to the German capital city to deliver the company’s first Research and Innovation Proposal Development Masterclass of the year. The two day training event, facilitated by European Academy, was attended by delegates from Finland and Lithuania and, as always, it made for a very interesting session. Following his return to RedKnight HQ, Dayne said, “It was a fantastic couple of days discussing how our attendees can use our expertise and knowledge to enhance their own Horizon 2020 proposals. The group were very engaging, which prompted some fascinating discussions on the current R&D landscape across Europe”. Next 25 February 2019, Innovate UK will launch a 2-phase competition to help National business solving business productivity problems and improving UK industry competitiveness. Thanks to a partnership between Innovate UK, the National Physical Laboratory, the National Measurement Laboratory at LGC, the National Engineering Laboratory and the Science and Technology Facilities Council, up to £4 million will be made available to work with leading scientists and research facilities to explore why a certain percentage defect rate is occurring within an existing production process. Upon successful completion of Phase 1, eligible candidates will have access to Phase 2 (opening date and deadlines TBC), which will offer grant funding to total eligible project costs up to £300,000. UK businesses can have a chance to save our oceans thanks to £6m available through simultaneous grants and private investment. The amount, made available by a public-private partnership between Innovate UK and Sky Ocean Ventures, will allow UK firms to become leaders in providing solutions to reduce pollution in world's oceans; a problem that is threatening to triple its magnitude by 2025, unless serious actions are taken (source: UN). To enable the UK to lead the fight against waste, catalyse new ideas and quickly get products and services to market, Innovate UK will devolve 50% of the whole sum in grants, whereas the remaining 50% will be funded by Sky Ocean Venture through private investment. Part of this is from the Plastics Research and Innovation Fund – a £20 million programme led by UK Research and Innovation. The competition to get access to this funding is now open and applicants are invited to submit their projects until midday on 13 March 2019 (first deadline). Micro and small businesses are eligible to apply, working alone, and they can get up to 100% of their project costs (expected between £100,000 and £200,000), equally split between Innovate UK and Sky Ocean Ventures. If you think your business is most suited to run for this funding opportunity, but you don't know how, Please do get in touch for a FREE consultation. EU financing of €122m for transport projects: Six days left! Businesses in the transport sector have time until 16 January 2019 to submit short project proposals in the areas of waterborne transport, logistics, aviation, transport infrastructure and safety, and so have the chance to get access to €122m worth of funding under the 2018-2020 Horizon 2020 Work Programme. The funding is divided into eight different topics (available here) and Applicants have to submit their proposals electronically, as a part of a two-stage process. Proposals submitted by 16 January 2019 will be evaluated within the next three months; successful applicants will be invited to proceed onto the second stage and submit full project proposal by 12 September 2019. The final decision about which projects will receive EU funding will be known the latest by February 2020 at the latest. Applicants are invited to consult the General Annexes (pdf) of the 2018-2020 Work Programme for rules on funding, standard eligibility criteria, submission rules, funding rates and other useful information.